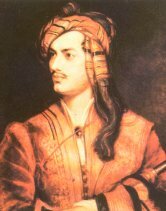 Did Lord Byron really have epilepsy? If one searches through the biographies of the greatest English Romantic poet - either to find evidence to support or prove wrong Nietzsche's opinion - one finds passages in a few places which suggest that Byron might possibly have suffered epileptic seizures. At the age of 16, when Byron heard that the woman whom he loved was considering getting married, he 'fell prey to violent convulsions'. The poet himself remarks: 'I almost suffocated.' On reading the description of such events, one immediately thinks of psychogenic seizures, especially when one remembers the poet's sensitive, emotional and neurotic character. The incident which occurred in the last few weeks before Byron's death, is another matter, however. William Parry, one of Byron's companions on his visit to the Greek town of Mesolongion (where Byron had hurried in order to personally take the side of the Greeks in their fight for freedom against the Turks), describes how Byron suddenly swayed and sank to the floor after drinking cognac punch and cider. This last incident could really have been an epileptic seizure, possibly an occasional convulsion - either triggered by excessive alcohol consumption and extreme physical exhaustion, or caused by the onset of meningo-encephalitis, which led to Byron's death two months later (as was proved in the autopsy). If we look at the passages in which Byron writes of symptoms which have some similarity to epilepsy, we must come to the conclusion that the poet did not suffer from chronic epilepsy. It is, however, probable that he did suffer psychogenic convulsions and other nervous attacks, and had an epileptic seizure, which can be classed an occasional convulsion, two months before his death.